August 21 is the harvest-time feast of Consualia, honoring the Roman god of grain storage, Consus. We mark on this occasion the legendary capital punishment inflicted by Lucius Junius Brutus when he was consul of the ancient Roman Republic upon two rebels — his own sons, Titus and Tiberius. Upon completing his coup, Brutus immediately summoned the populace to swear an oath that no king would ever rule Rome again. So potent was the civic memory of this event that even centuries later when the Republic was well gone, Rome’s emperors dared not appropriate such an incendiary title as “King”. But that was for a later time, after the winners wrote the history. The exiled Etruscan king, subsequent Romans’ eternal watchword for tyranny, got the boot about 510 B.C.E., and in 509 was still hanging about looking for an opportunity to re-seat his dynasty. The plot he hatched is known as the Tarquinian conspiracy, and Brutus, to his grief, would discover that his own children had adhered to it. The statesman’s willingness to put his own flesh and blood to death for the security of Rome would long stand as a parable of manful patriotism. Our account here is from Livy (line breaks have been added for readability), and the excuse to approximate this undated execution to summer’s harvest-time is bolded therein. liberty was well nigh lost by treachery and fraud, a thing they had never apprehended. There were, among the Roman youth, several young men of no mean families, who, during the regal government, had pursued their pleasures without any restraint; being of the same age with, and companions of, the young Tarquins, and accustomed to live in princely style. Whilst their minds were already thus discontented of their own accord, ambassadors from the royal family come unexpectedly, demanding restitution of their effects merely, without any mention of return. After their application was heard in the senate, the deliberation on it lasted for several days, (fearing) lest the non-restitution might be a pretext for war, and the restitution a fund and assistance for war. In the mean time the ambassadors were planning different schemes; openly demanding the property, they secretly concerted measures for recovering the throne, and soliciting them as if for the object which appeared to be under consideration, they sound their feelings; to those by whom their proposals were favourably received they give letters from the Tarquins, and confer with them about admitting the royal family into the city secretly by night. The matter was first intrusted to brothers of the name of Vitellii and those of the name of Aquilii. A sister of the Vitellii had been married to Brutus the consul, and the issue of that marriage were young men, Titus and Tiberius; these also their uncles admit into a participation of the plot: several young noblemen also were taken in as associates, the memory of whose names has been lost from distance of time. In the mean time, when that opinion had prevailed in the senate, which recommended the giving back of the property, and the ambassadors made use of this as a pretext for delay in the city, because they had obtained from the consuls time to procure modes of conveyance, by which they might convey away the effects of the royal family; all this time they spend in consulting with the conspirators, and by pressing they succeed in having letters given to them for the Tarquins. For otherwise how were they to believe that the accounts brought by the ambassadors on matters of such importance were not idle? The letters, given to be a pledge of their sincerity, discovered the plot; for when, the day before the ambassadors set out to the Tarquins, they had supped by chance at the house of the Vitellii, and the conspirators there in private discoursed much together concerning their new design, as is natural, one of the slaves, who had already perceived what was going on, overheard their conversation; but waited for the occasion when the letters should be given to the ambassadors, the detection of which would prove the transaction; when he perceived that they were given, he laid the whole affair before the consuls. The consuls, having left their home to seize the ambassadors and conspirators, crushed the whole affair without any tumult; particular care being taken of the letters, lest they should escape them. The traitors being immediately thrown into chains, a little doubt was entertained respecting the ambassadors, and though they deserved to be considered as enemies, the law of nations however prevailed. The question concerning the restitution of the tyrants’ effects, which the senate had formerly voted, came again under consideration. The fathers, fired with indignation, expressly forbad them either to be restored or confiscated. They were given to be rifled by the people, that after being made participators in the royal plunder, they might lose for ever all hopes of a reconciliation with the Tarquins. A field belonging to them, which lay between the city and the Tiber, having been consecrated to Mars, has been called the Campus Martius. It happened that there was a crop of corn* upon it ready to be cut down, which produce of the field, as they thought it unlawful to use, after it was reaped, a great number of men carried the corn and straw in baskets, and threw them into the Tiber, which then flowed with shallow water, as is usual in the heat of summer; that thus the heaps of corn as it stuck in the shallows became settled when covered over with mud: by these and the afflux of other things, which the river happened to bring thither, an island was formed by degrees. Afterwards I believe that mounds were added, and that aid was afforded by art, that a surface so well raised might be firm enough for sustaining temples and porticoes. After plundering the tyrants’ effects, the traitors were condemned and capital punishment inflicted. Their punishment was the more remarkable, because the consulship imposed on the father the office of punishing his own children, and him who should have been removed as a spectator, fortune assigned as the person to exact the punishment. Young men of the highest quality stood tied to a stake; but the consul’s sons attracted the eyes of all the spectators from the rest of the criminals, as from persons unknown; nor did the people pity them more on account of the severity of the punishment, than the horrid crime by which they had deserved it. The consuls seated themselves in their tribunal, and the lictors, being despatched to inflict punishment, strip them naked, beat them with rods, and strike off their heads. Whilst during all this time, the father, his looks and his countenance, presented a touching spectacle, the feelings of the father bursting forth occasionally during the office of superintending the public execution. 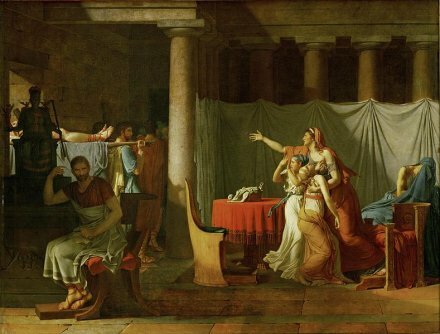 Bummer: Jacques-Louis David‘s 1784 painting, Lictors Bring Home the Sons of Brutus. This Brutus was an ancestor of the Brutus who helped assassinate Julius Caesar, and that later et tu, Brutus is commonly represented as having been convinced to turn against his friend and patron by, in part, the example of his legendary namesake.